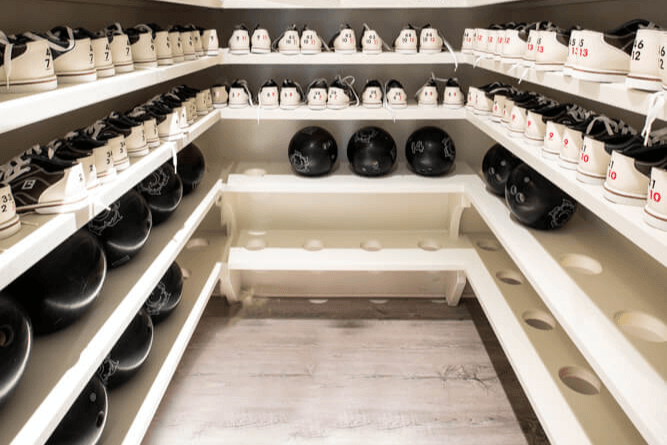 This page provides design ideas for bowling ball and shoe storage solutions in your home bowling alley. 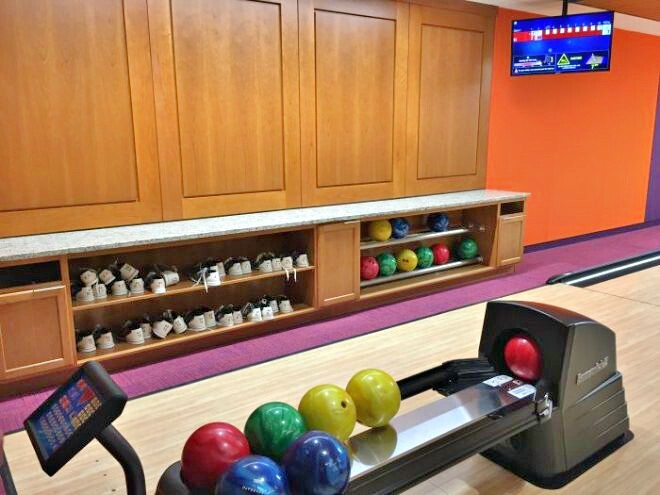 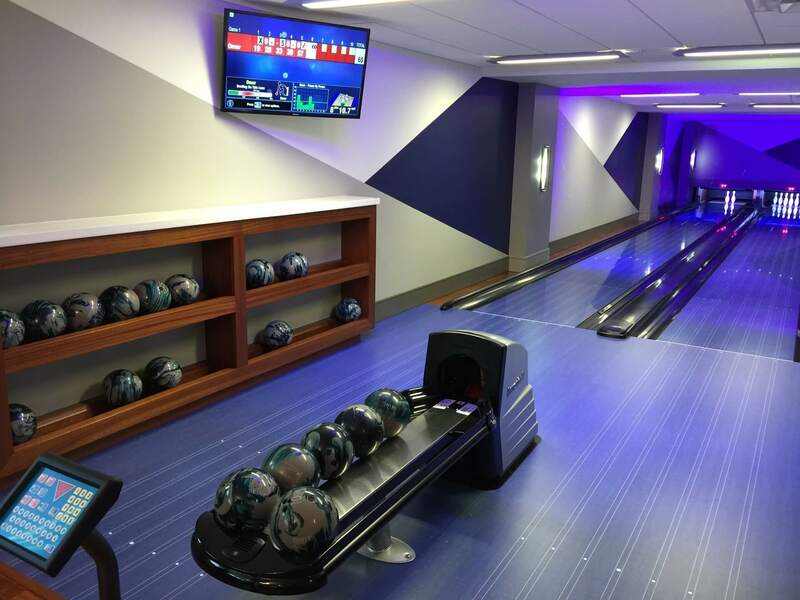 In the photo gallery below, you can browse photos of built-in shelving, cubbie holes, rails, racks, lockers, etc that some of our customers have built in their private bowling alleys. 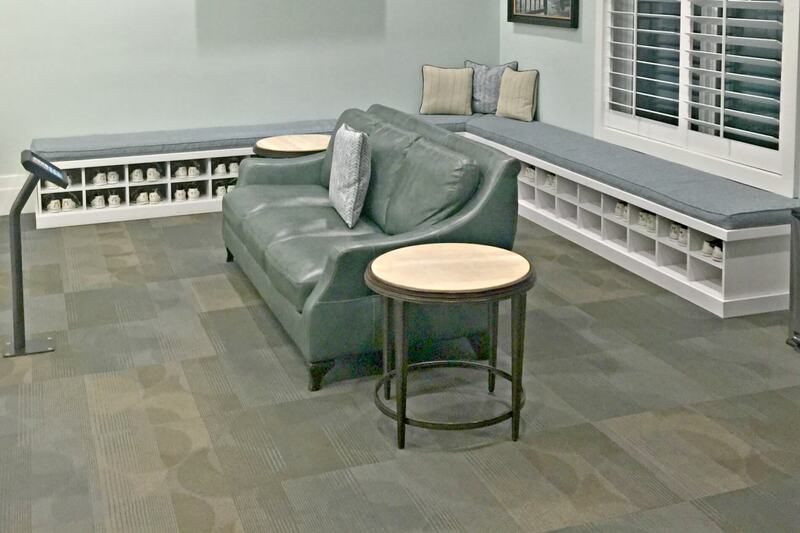 While we do not offer these items ourselves, we provide these photos as a resource for discussions with your interior designer and trim carpenter. 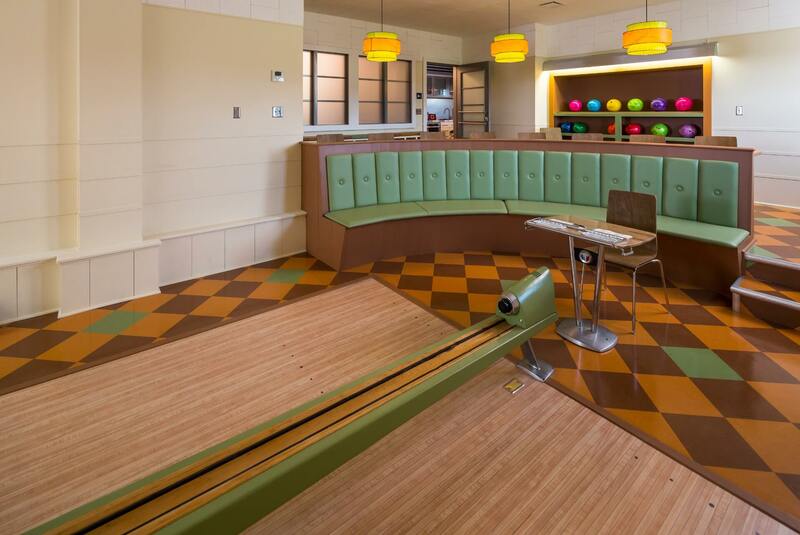 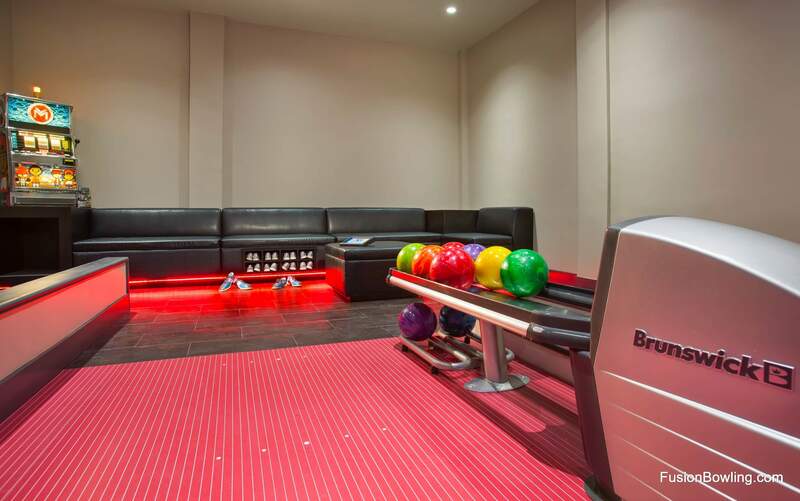 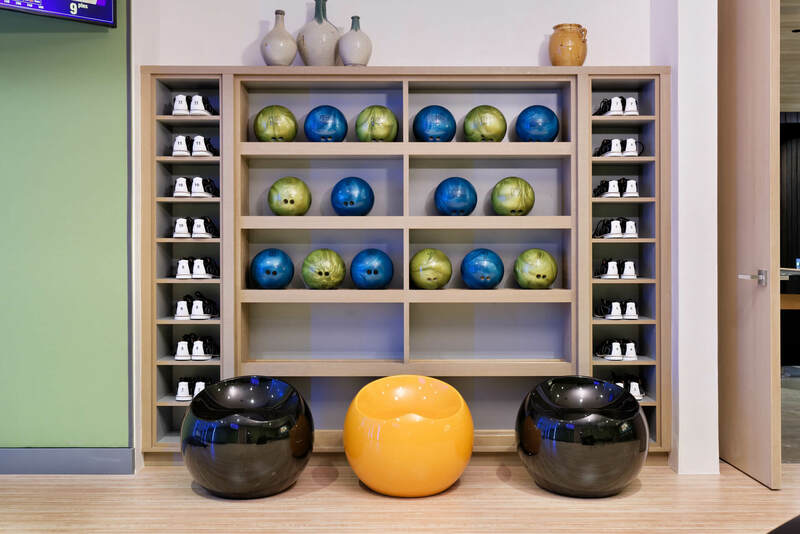 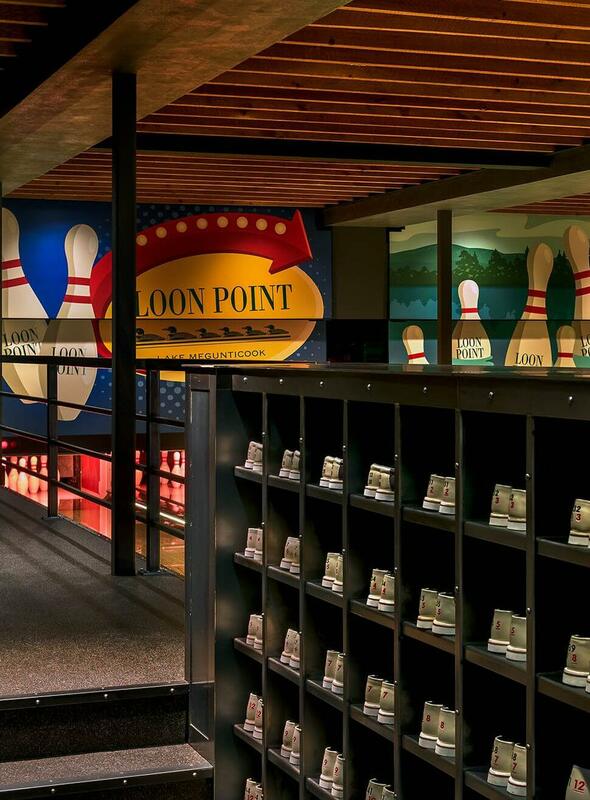 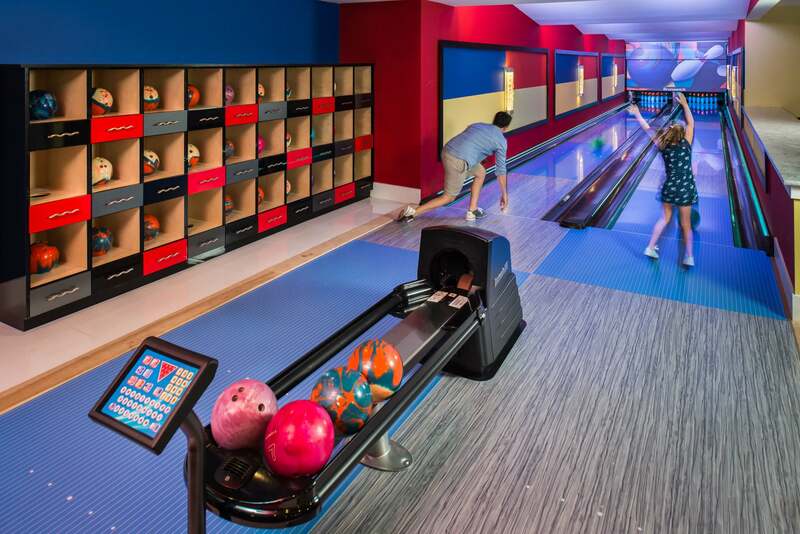 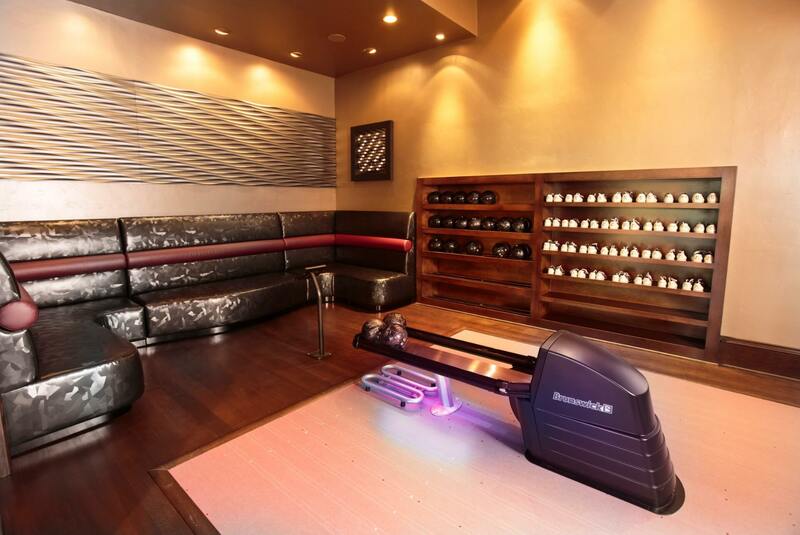 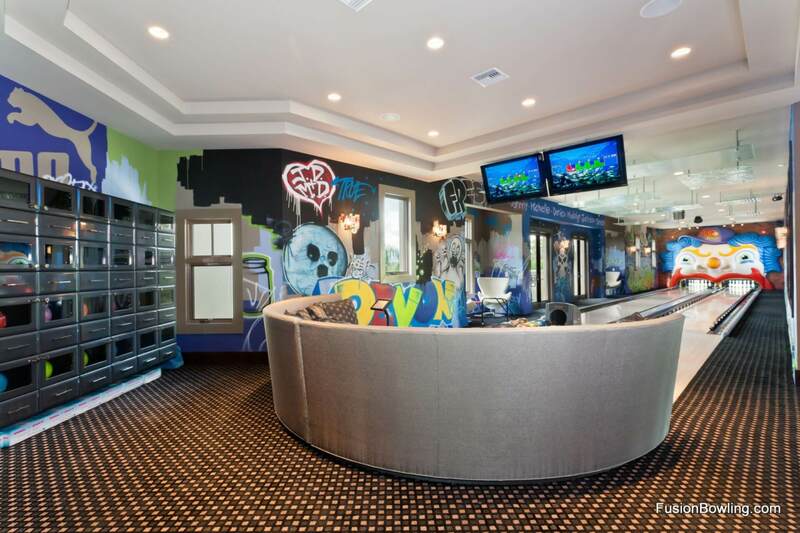 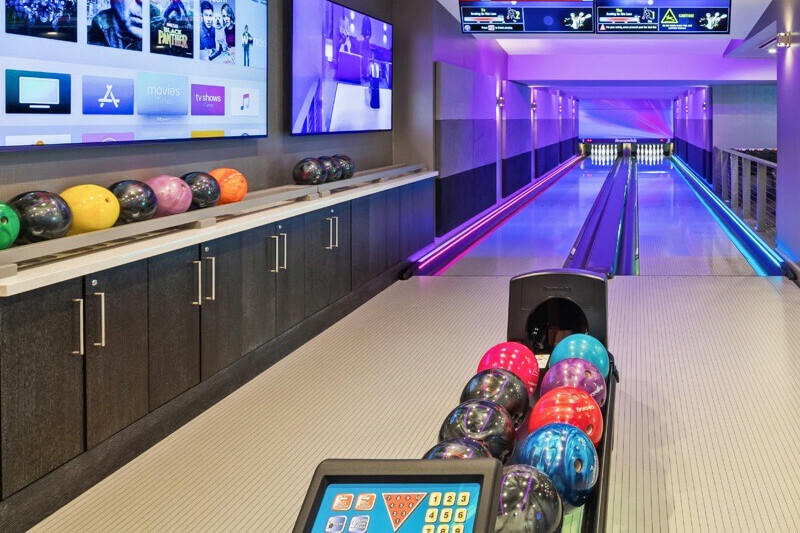 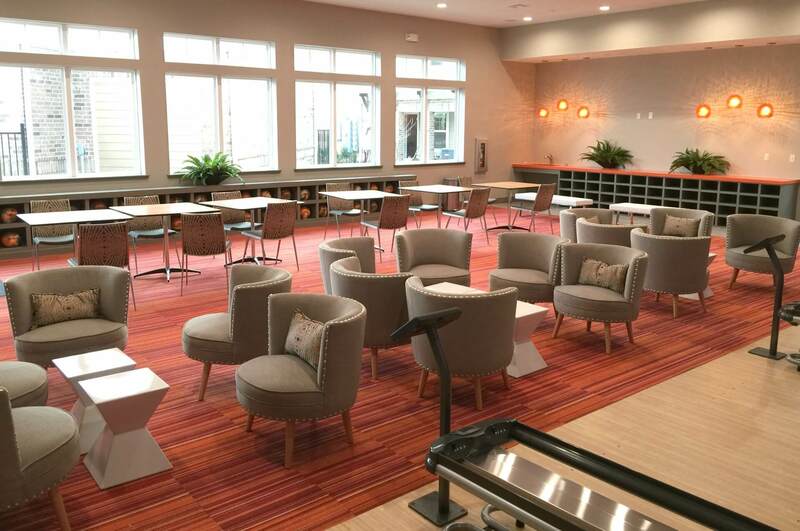 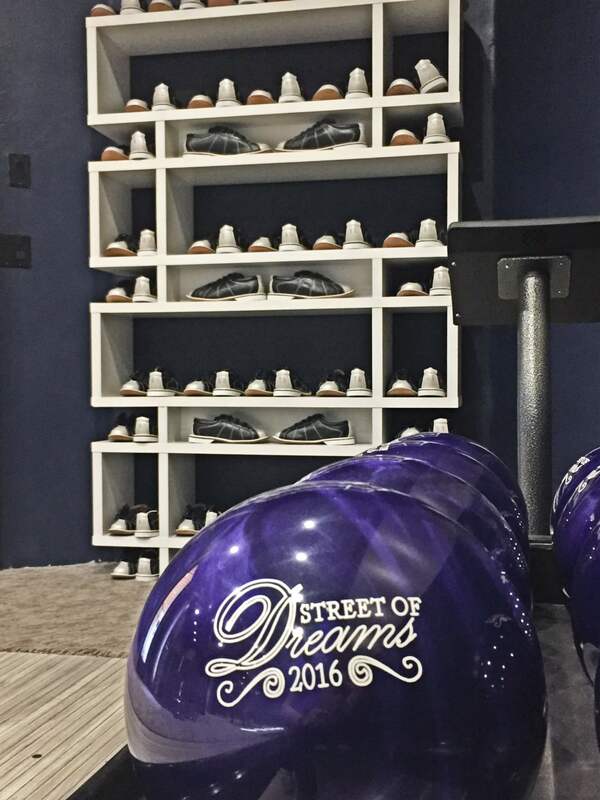 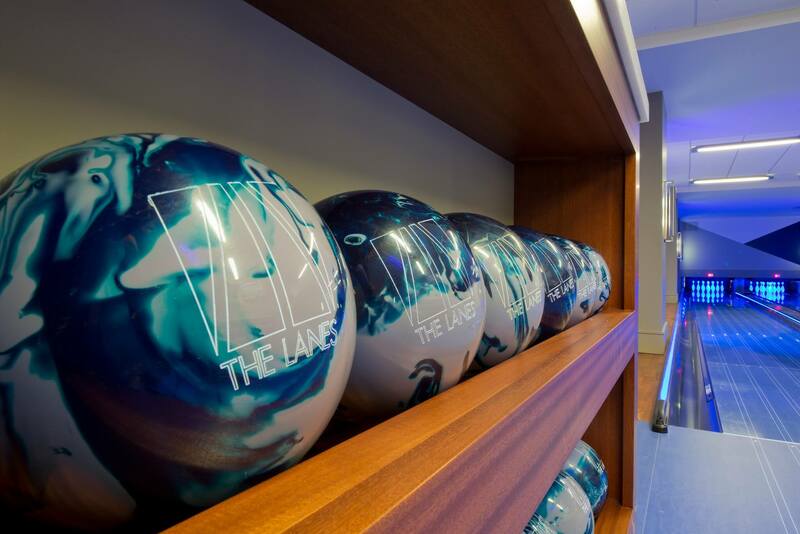 For the customers who opt for guest bowling balls that are custom made, all of the balls have the same design, and as such, they can function as an interior design accent color for the room. 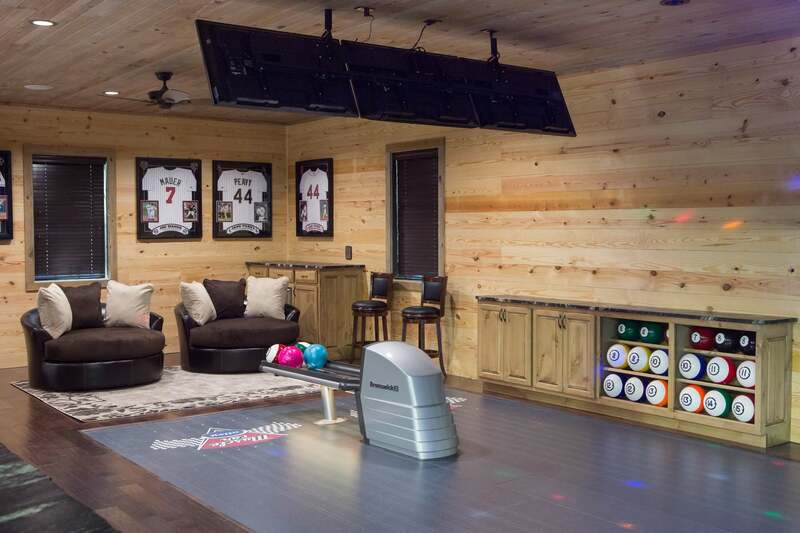 In these cases, open storage makes sense. 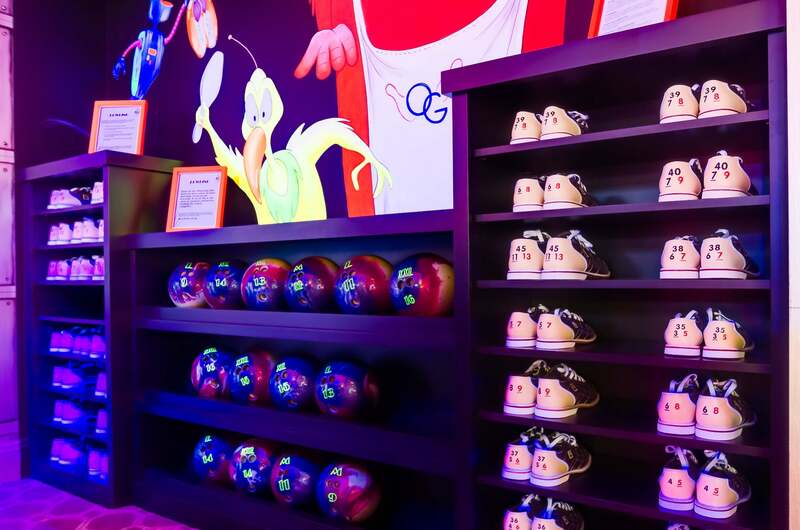 Even in cases were there are an assortment of colors, it's a good idea to make the balls and shoes easily visible and accessible to the bowlers. 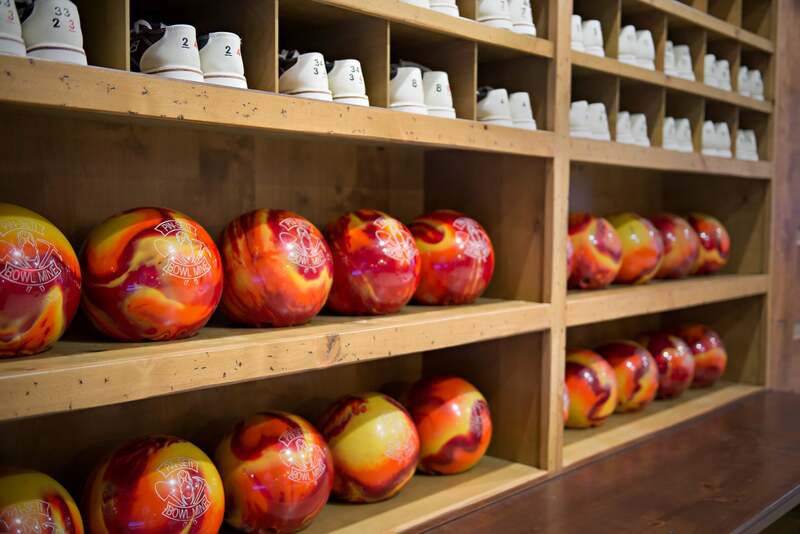 Bowling shoes have the size number on the back of each shoe, and bowling balls have a weight label. 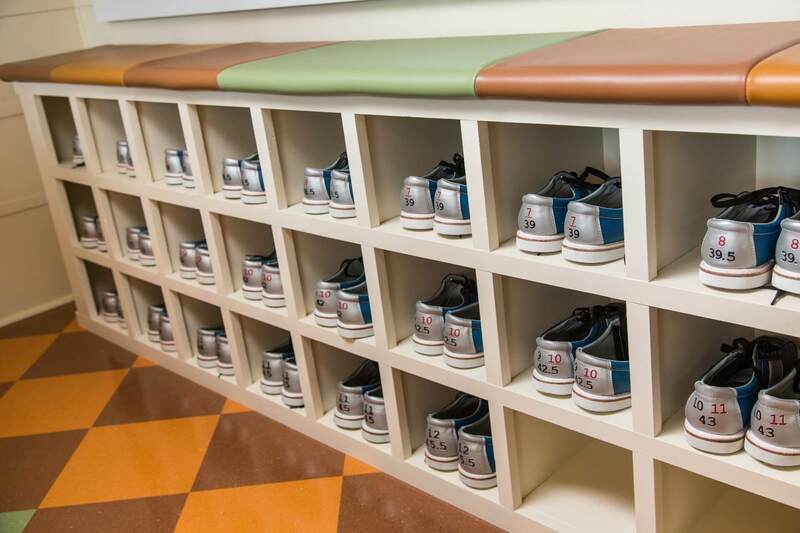 Open storage makes it easier for bowlers to quickly find the sizes they need. 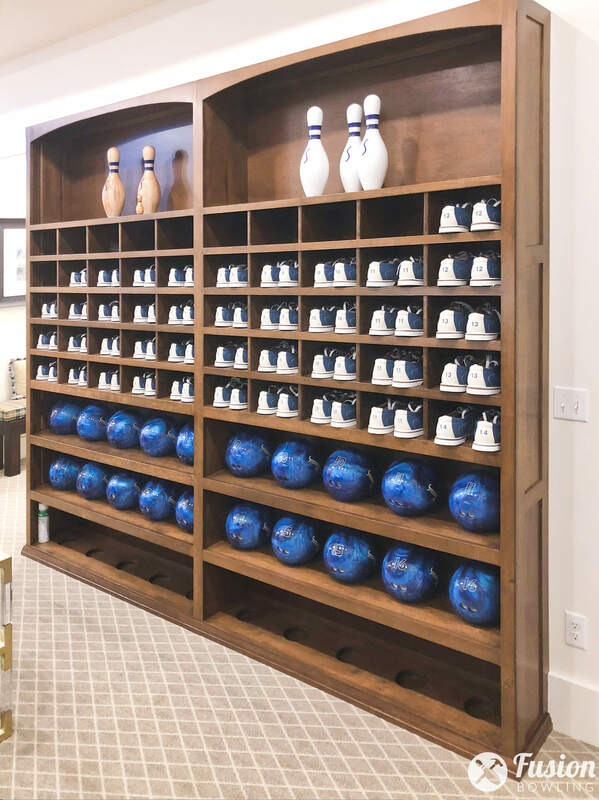 Trim carpenters build several different types of bowling ball storage designs, but there are a few that we see frequently. 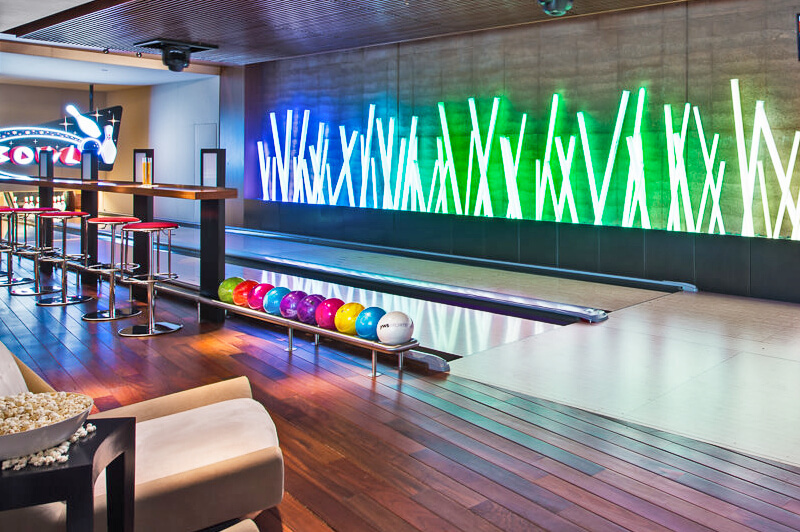 The most common category is "parallel rails". 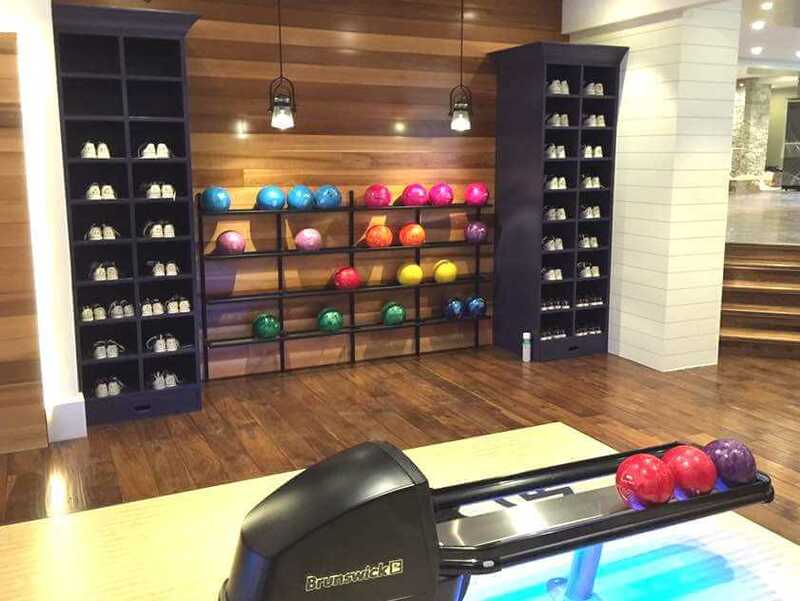 The rails can be square metal tubes, round chrome pipes, wooden boards, etc. 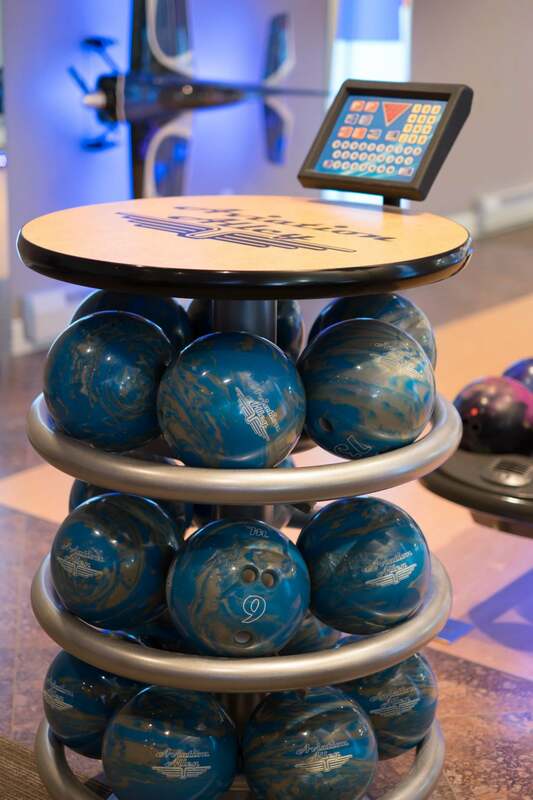 The balls sit down between the rails, allowing side-to-side movement, but prohibiting front-to-back movement. 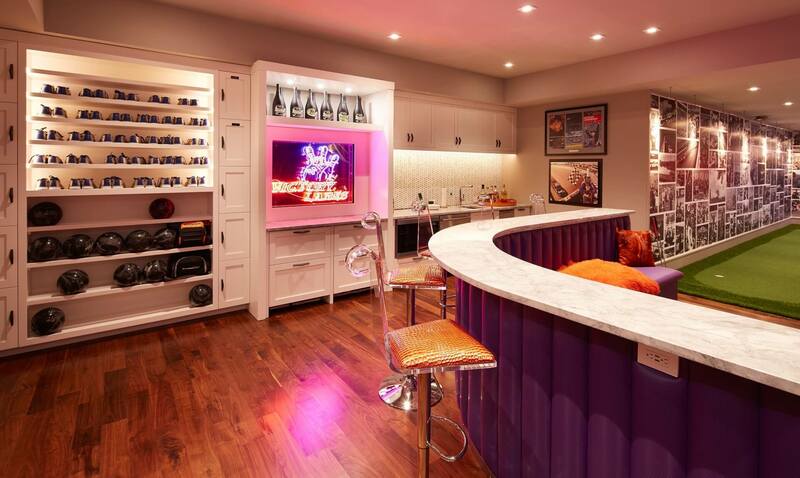 The other type we see a lot is round holes cut into shelves. 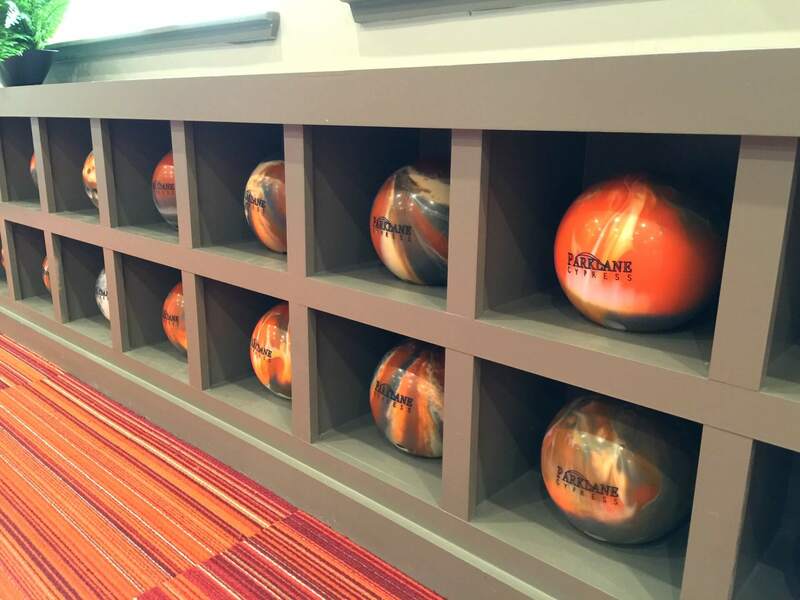 The diameter of the hole doesn't need to be that big - just enough to prevent the ball from rolling off the shelf. 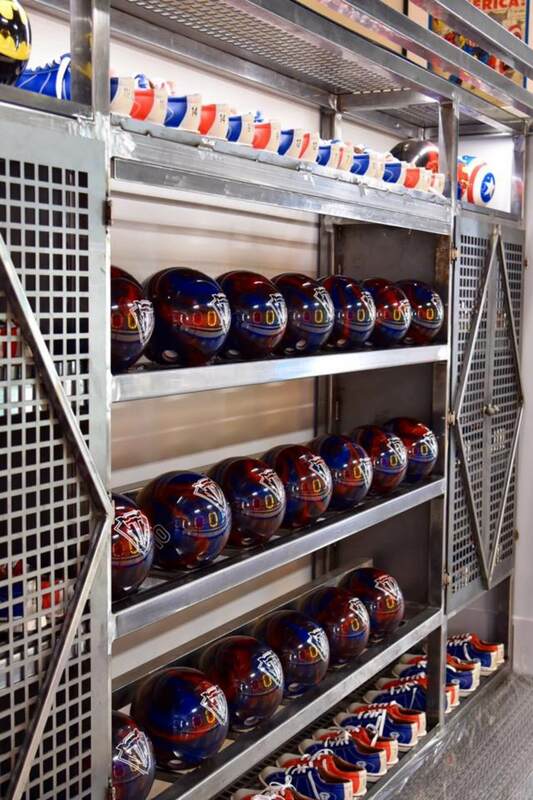 The advantage of this design is the spacing of the balls is perfectly uniform. 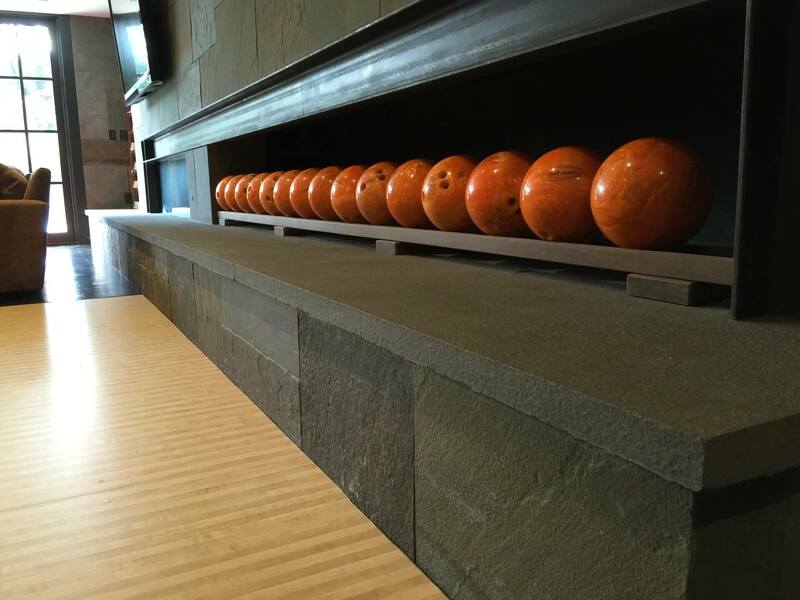 The edge of the hole can be routed with a 45-degree chamfer. 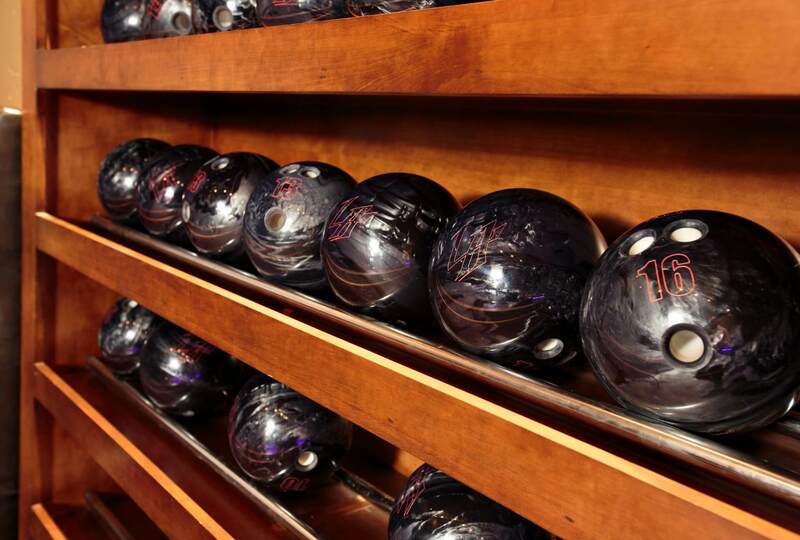 All bowling balls have the same diameter (regardless of weight): 8 - 9/16 inches. 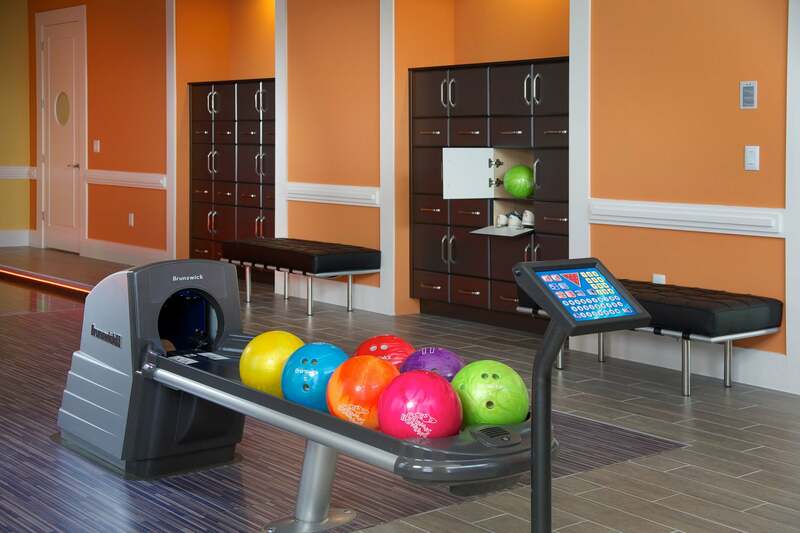 Don't forget about ergonomics! 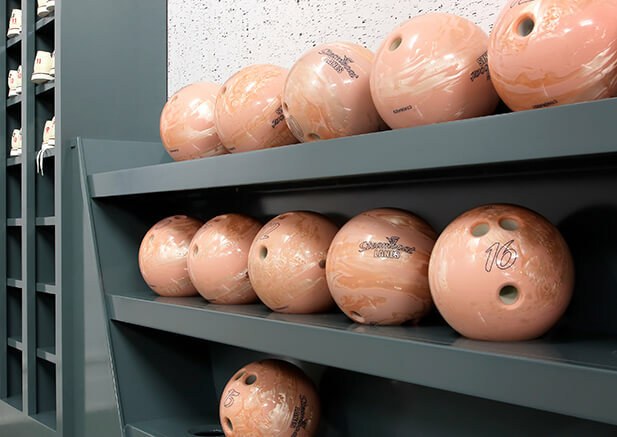 Bowling balls can be heavy and awkward to handle, especially for the elderly and young children, and especially if the balls have some bowling lane oil on them. 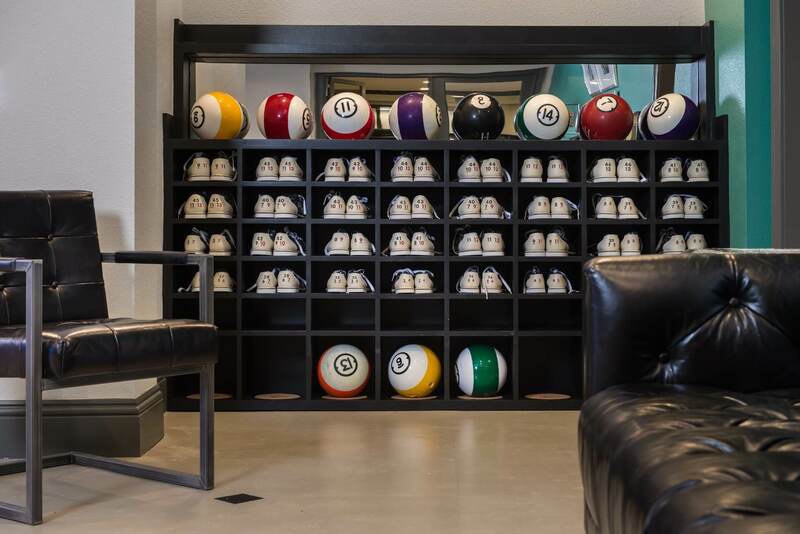 Balls should be stored at a comfortable height — somewhere around waist high works well. 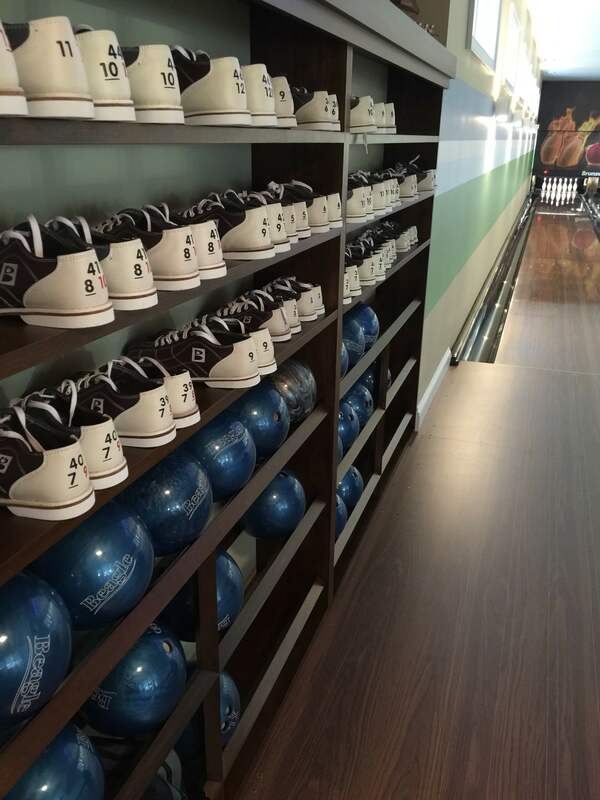 Forcing bowlers to reach high or to stoop all the way to the floor increases the risk of injuries and accidents. 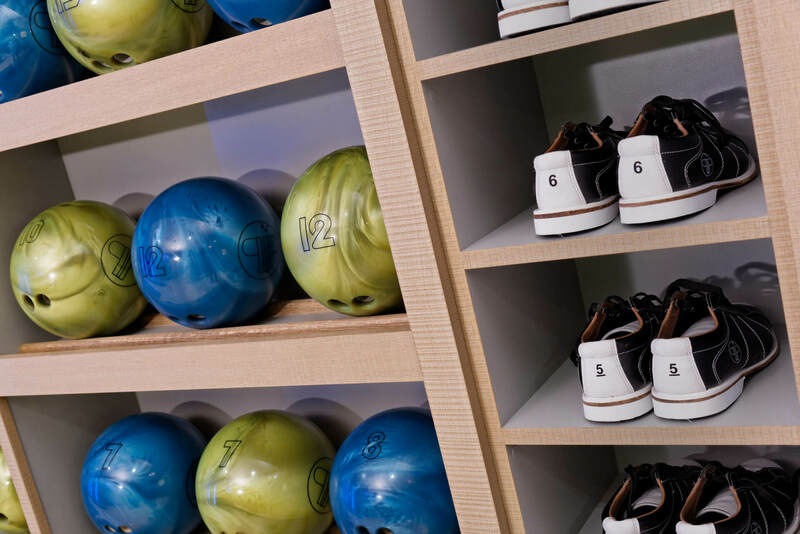 Also, make sure the bowler can stand right next to the shelving (with extra room for the bowler's toes to go underneath the shelving if possible). 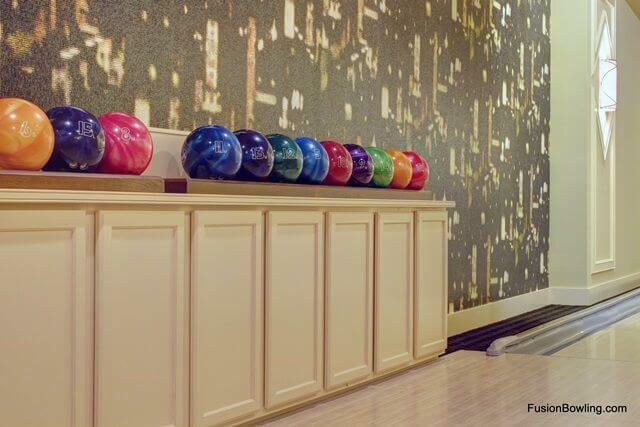 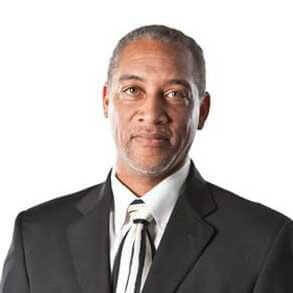 Make sure the bowling balls are not inset into the wall, away from the bowler. 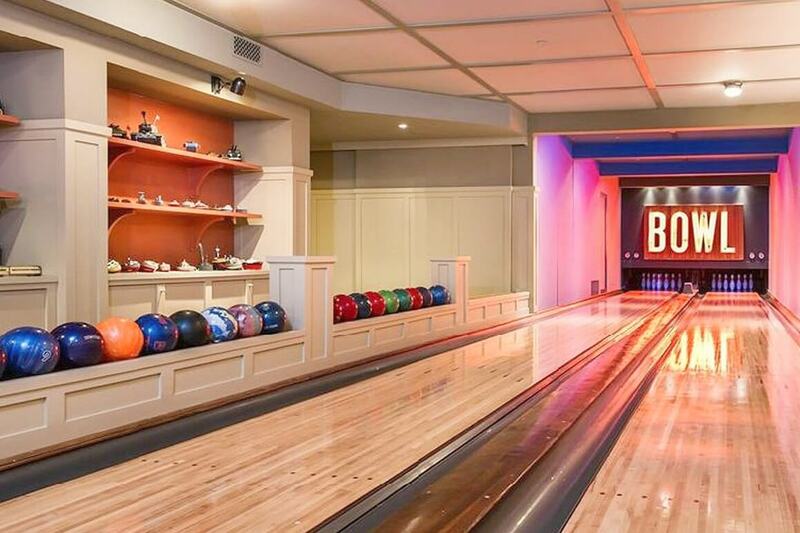 In other words, don't force the bowler to reach out horizontally over some impediment. 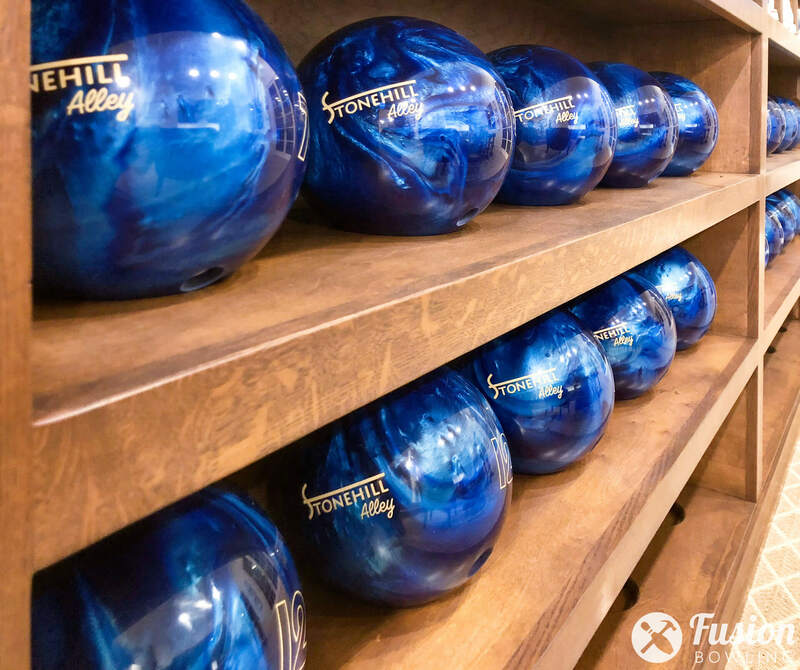 This creates more torque on the shoulder and back. 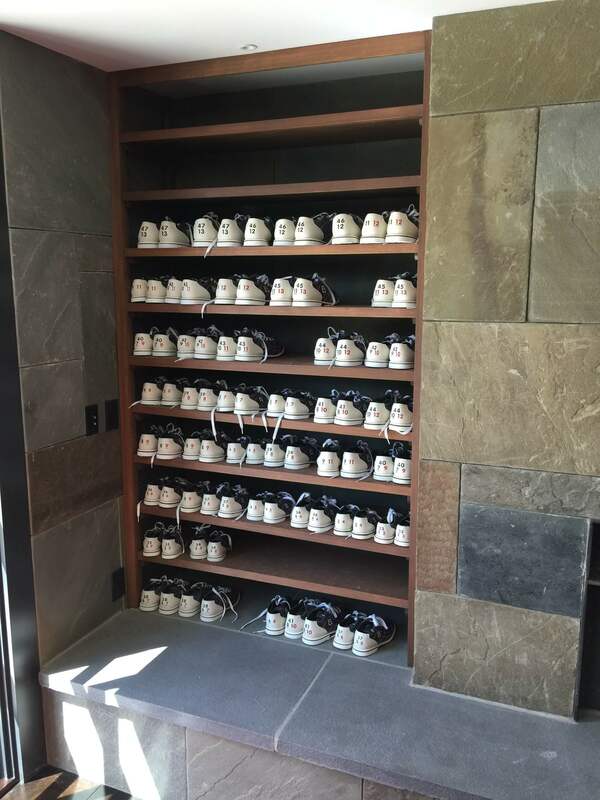 Shoe storage usually consists of simple flat shelves or individual cubbie holes. 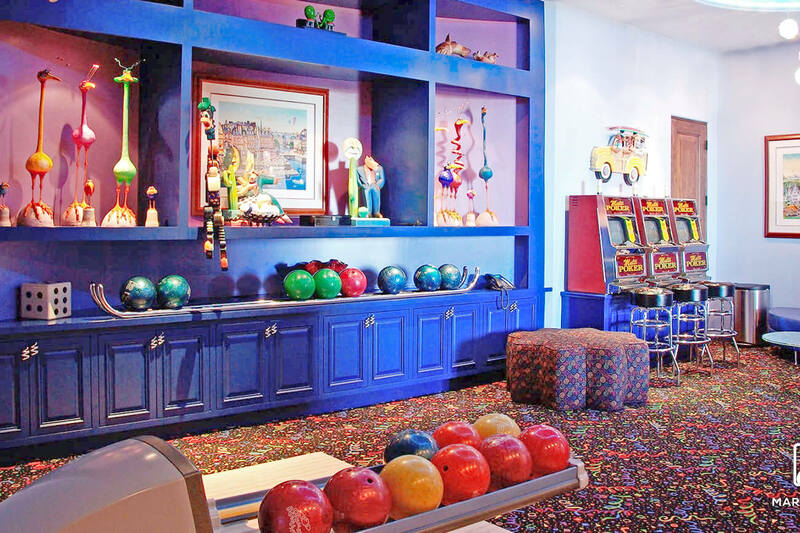 A cubbie hole size that works well is 10 inches wide on center, and 6 inches tall on center. 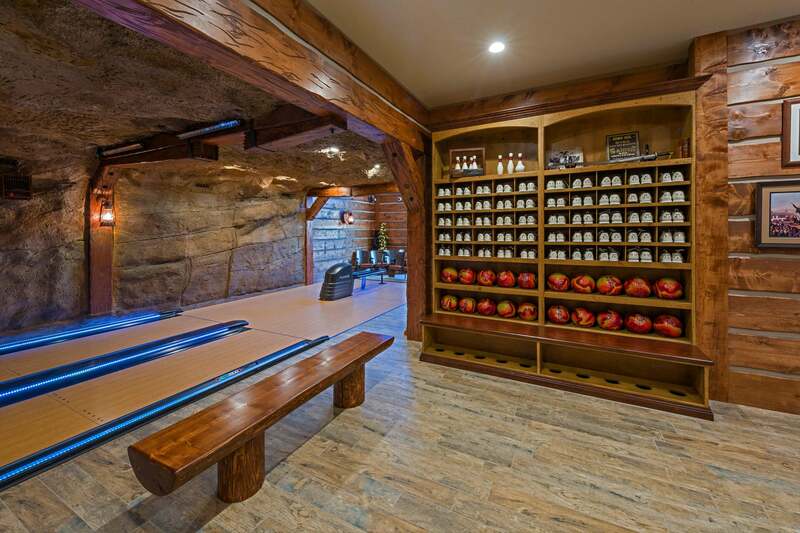 A depth of 12 inches makes sense, as this corresponds to the length of a larger size for an adult male, as well as the depth of a standard upper cabinet. 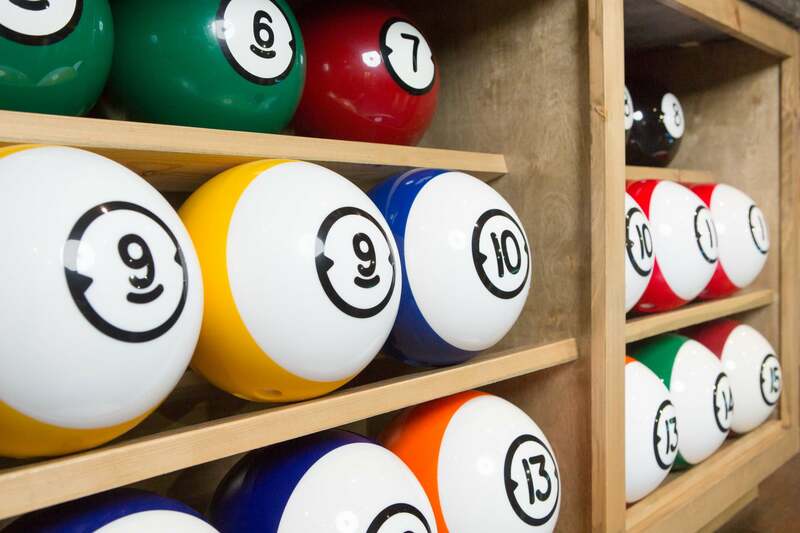 A depth of 12 inches also works well for the ball storage, although balls are a little smaller.